The Covariance Matrix Adaptation Evolutionary Strategy (CMA-ES) is a well-known, state-of-the-art optimization algorithm for single-objective real-valued problems, especially in black-box settings. Although several extensions of CMA-ES to multi-objective (MO) optimization exist, no extension incorporates a key component of the most robust and general CMA-ES variant: the association of a population with each Gaussian distribution that drives optimization. To achieve this, we use a recently introduced framework for extending population-based algorithms from single- to multi-objective optimization. We compare, using six well-known benchmark problems, the performance of the newly constructed MO-CMA-ES with existing variants and with the estimation of distribution algorithm (EDA) known as iMAMaLGaM, that is also an instance of the framework, extending the single-objective EDA iAMaLGaM to MO. Results underline the advantages of being able to use populations. Because many real-world problems have constraints, we also study the use of four constraint-handling techniques. We find that CMA-ES is typically less robust to these techniques than iAMaLGaM. Moreover, whereas we could verify that a penalty method that was previously used in literature leads to fast convergence, we also find that it has a high risk of finding only nearly, but not entirely, feasible solutions. 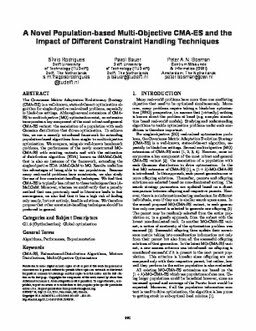 We therefore propose that other constraint-handling techniques should be preferred in general.